1: Govt. of India declared 26th Oct as public holiday to celebrate the end of Ra One promotions...! 2: Govt of India just announced Rs 50,000 relief to all those who watched RA1 and Rs.25,000 for those who left at interval. 4: Salman to SRK after watching Ra.One, "Mujh par ek ehsaan karna, dubara aisi movie mat banana"
6: Even Ra.mu doesn't wanna waste time by watching Ra.one...! 7: Nahi chala RA.ONE...! Ab SRK bolega buy one get one aur ek week ke baad bolega, RA.ONE coming soon on Sahara.One and Star.one. 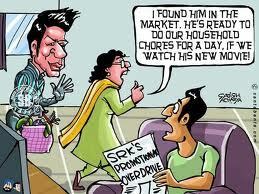 9: Get RA.ONE under Lokpal bill...! Put people behind bars who made such movie. 10: As SRK hates losing & hates messages he is surely going to take a break from Twitter. Now we came 2 know why he joined Google+ before RA1 release. 11: Faking News: 100 people committed mass suicide after watching Ra.one! I cdnt resist posting this.....I laughed so much when I got this in my mail and thought u guys deserved a treat too;-D.
Poor SRK...I suppose he knew...no scratch that, he very well knew how lousy his movie was but needed to pretend otherwise to recover the money. So how many of u have watched the movie or are planning to watch inspite of the reviews. And did u read Shobhaa De's review???? She nailed it;-D!!!! Not Fair. I loved the movie. No, seriously. Its got some good special effects and it is well made and has a story!!! It has crossed billions in collections. How can it be a flop then? :) ok its that BAD?! wudnt it touch with a barge pole, though with hols coming up planning to pick up some good CDs. any suggestions? ha ha... if this was about 'bodyguard' or someother salman movie, you wouldnt have posted this, right ;) he hee! you seem to have disappeared! All ok?? yes srk should take 'one.vaas' for making such a movie!